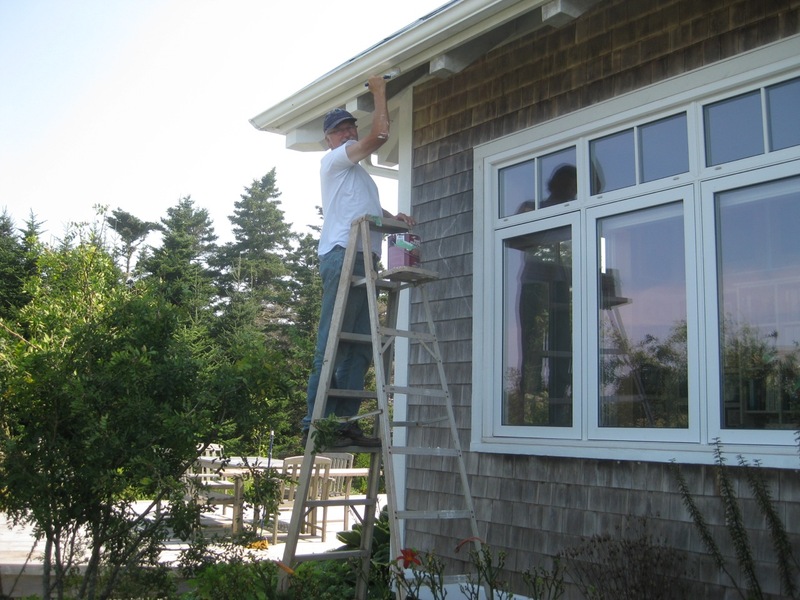 Frank accomplished a job he had put off for years…painting the roof overhang and rafter tails. He really never had the time before, but didn’t want to pay anyone to do it. 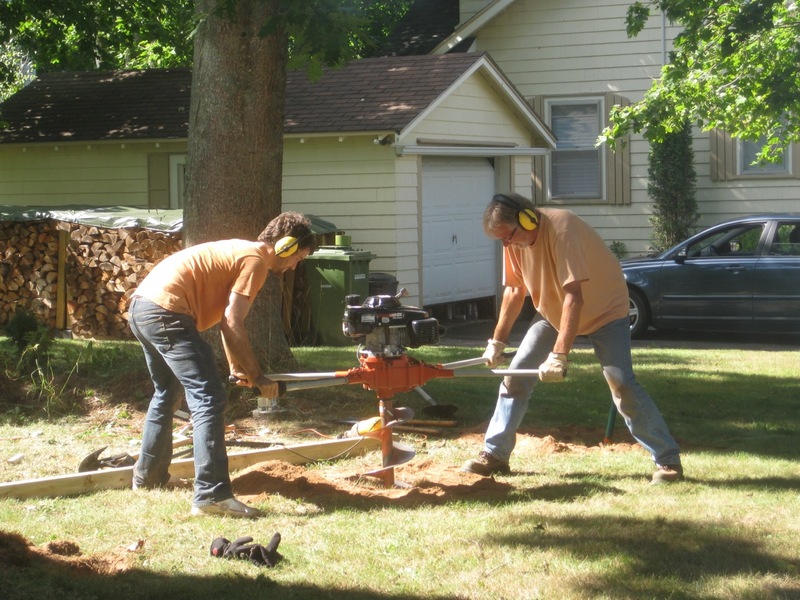 Retirement “saved” him the cost of the job, and only took, all told, about 20 hard, pain in the neck hours. It’s so satisfying to get a nagging job off your plate. I love to put things off and work under pressure, but there is a weight on me as I procrastinate. Frank has made our home shine outside over the course of the summer, and as the weather cools, he’ll work on the inside. He’ll work without anything nagging him, as now he has the gift the time. Where are my playmates? gone to Wolfville everyone. We’ve had visitors from Toronto, Ottawa, Switzerland as well. All gone. 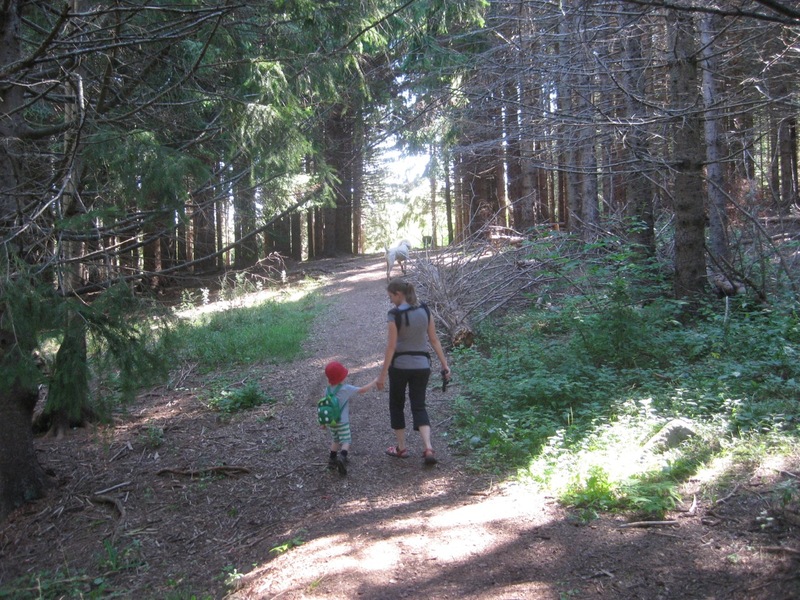 Summer is over when we’re back to two of us. It has a gentle feel, like the photo, but still with some longing. As well my blog year is also drawing to an end..about a week left. Writing each day makes me conscious of the time passing in a larger way, and also shows me the circles that repeat each year. I know the deck will be peopled next summer once again. 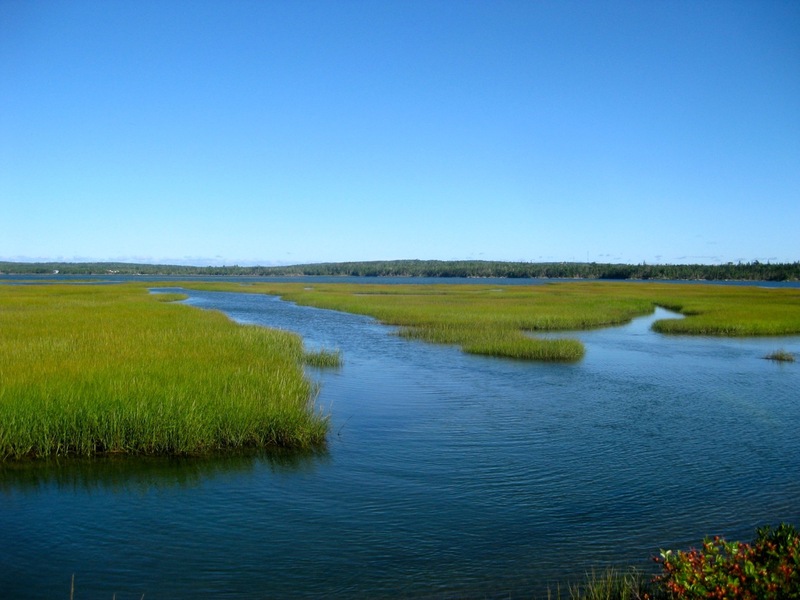 A chance to join my hiking group today for a Salt Marsh hike, not far from home. The beauty is always striking even though I see if often. Today a new immigrant from Russia, came by the house to get a free bed. He told me that the drive over made his soul move, then said he had lived by a lake outside of Moscow, and his mind neglected to get used to the wonderful view. I loved that “new” English! how true his words. 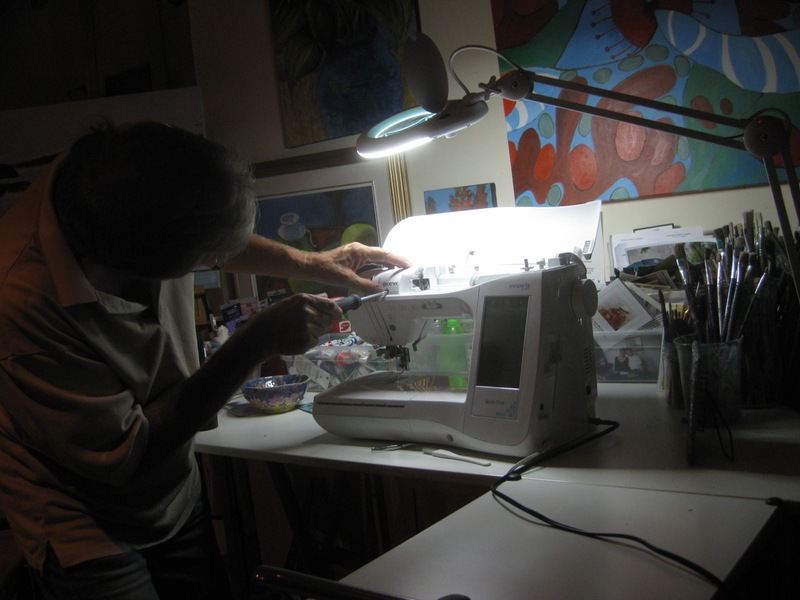 I spent hours in the afternoon, fighting with my machine, convinced that it would need a repair job and be away from me for weeks, when I needed it now. As usual, I work best under pressure, and the time left to complete my present project is extremely little. Frank to the rescue, though he too spent hours, opening up the machine the way he once did with our first car…just doing it. That time he had some parts left over! but Success! then and now. It’s great to have a handy man around the house. Thank goodness this man is retired. Now back to sewing. 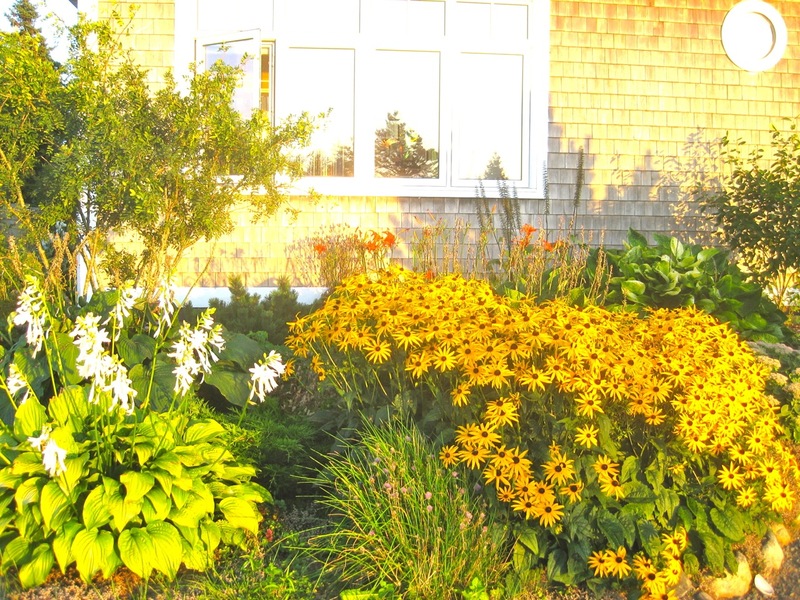 Back home, where the setting sun tonight added an extra golden glow to the late summer garden. At this time of year my drive for gardening starts to wane. I always appreciate the seasons. 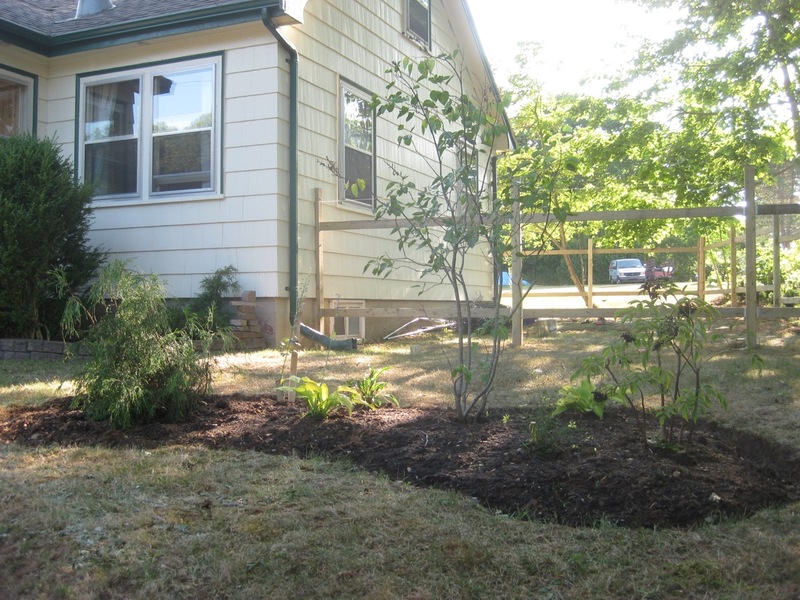 That brings the excitement of gardening anew each Spring, and then the rest that Fall brings as my green thumb gets numb. Then comes Winter, and I start to get antsy for Spring to arrive and let me back to gardening. Don’t you love it? Like a gerbil spinning on a wheel. 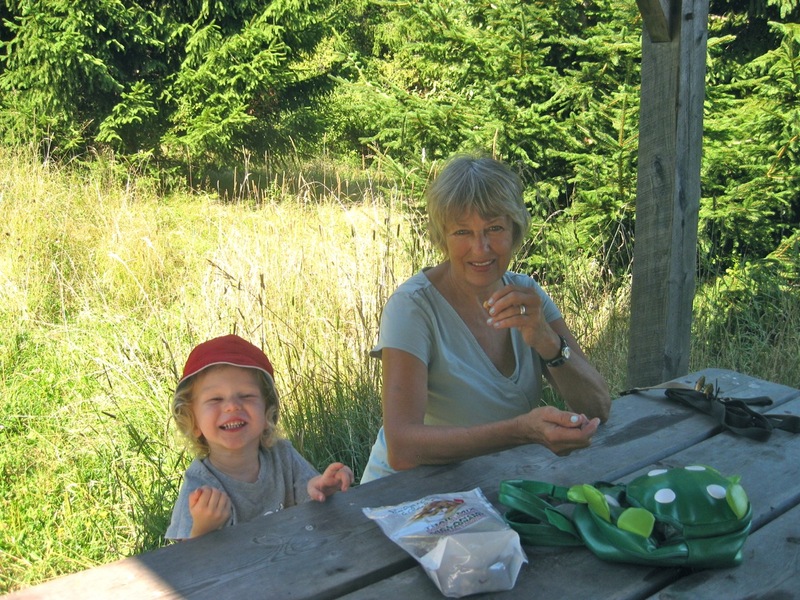 what better snack than Trail Mix? New garden installed, the fence coming along..all set to go quickly now. Jobs done, family set up for Will to set off back to work tomorrow. A real satisfaction in all of that for us. Home again..how quiet it is. Weird. 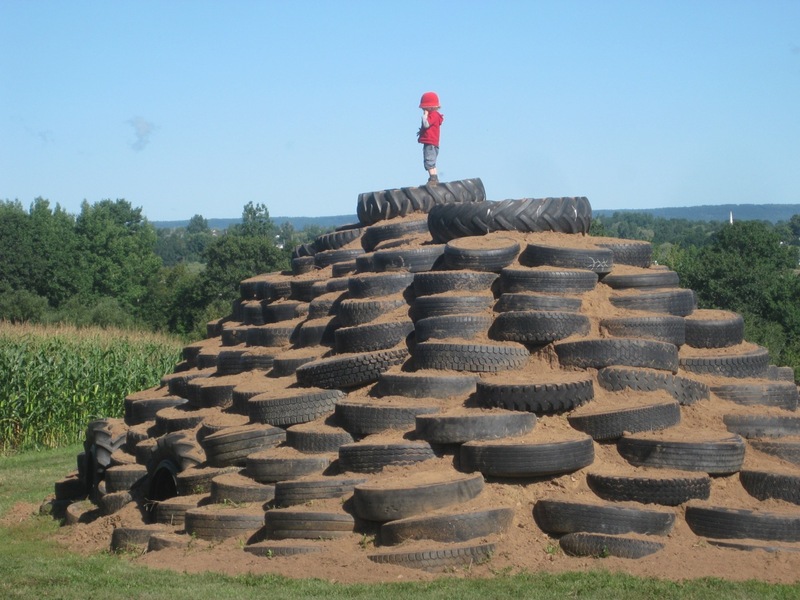 Jen and I took the boys to a corn maze, but first Forest climbed this hill of tires, then thought, now what? I think mountain climbing might have come to mind. I love seeing children have these “firsts”. What a privilege to behold it. We all continue to have “firsts”. 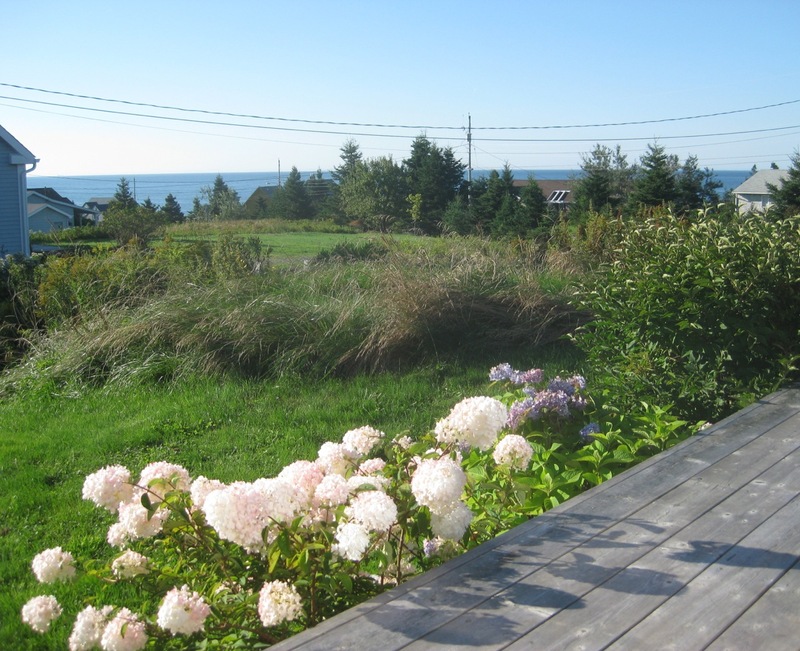 The extreme friendliness of Nova Scotians had once been a first for us. Now we accept and expect it. It seems to filter into “come from aways’” psyches after years of living here. Jen’s many neighbours are so friendly that I’m sure they’re from N.S., then when I ask, often they’ve chosen to live here, but they’re CFAs. Wonderful trait for a province pass on to its residents. One day’s reprieve, then back to hard work…10 hrs. of this for the guys, more than 30 years apart in age. Wow, it makes ageism just seem wrong. Watching the workers, pretending to be cantering along…I love pretending, the more I do this with the kids, the more I think it’s so healthy. I’ll pretend that I’m a singer, guitarist, and dancer..I’ve always wanted to have those abilities, just on a personal level, and now I can…pretend to. 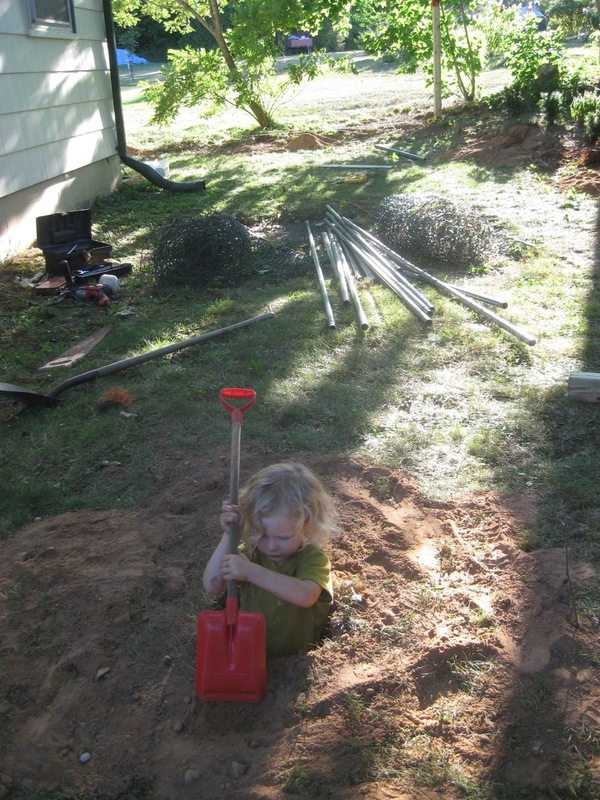 Forest asked if I could be on his “crew”…okay, let’s pretend I am…that lead to me shovelling the earth into a wheel barrel, which made me decide to create a garden island on the grass in front…tomorrow’s job. It wouldn’t have seemed right not to have something to do with gardening while here. I don’t have to pretend to love being a gardener, and to appreciate the skills I do have, in real life. Today at home, I worked on my studio, where Forest has slept for 4 months. I put “Forest’s” bed into the other bedroom, which was completely emptied by Jen and Will for the new house. I LOVE the room with no bed in it! It feels so spacious, so breathable, calling me to do something soon. When Forest visits, I’ll fling a mattress onto the floor. 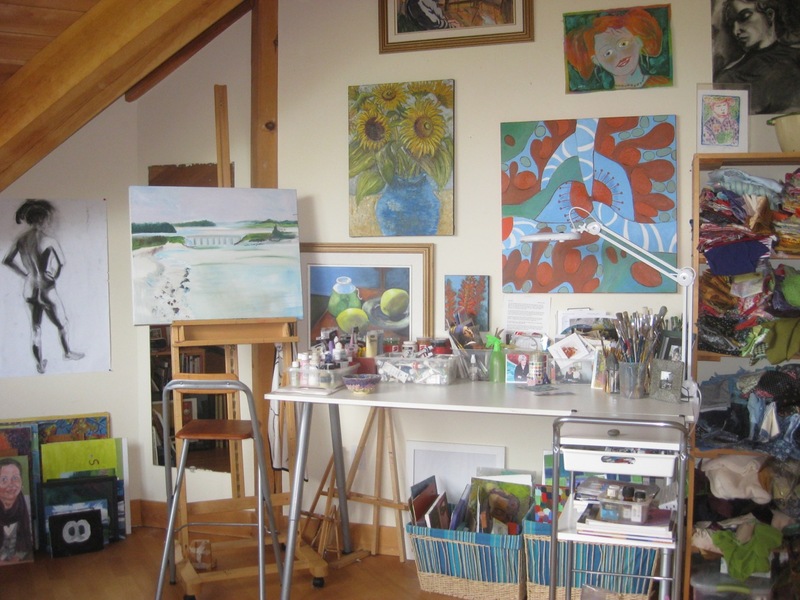 Oh, I love this sense of my space, after 9 years of having a bed in my studio. What a simple luxury. 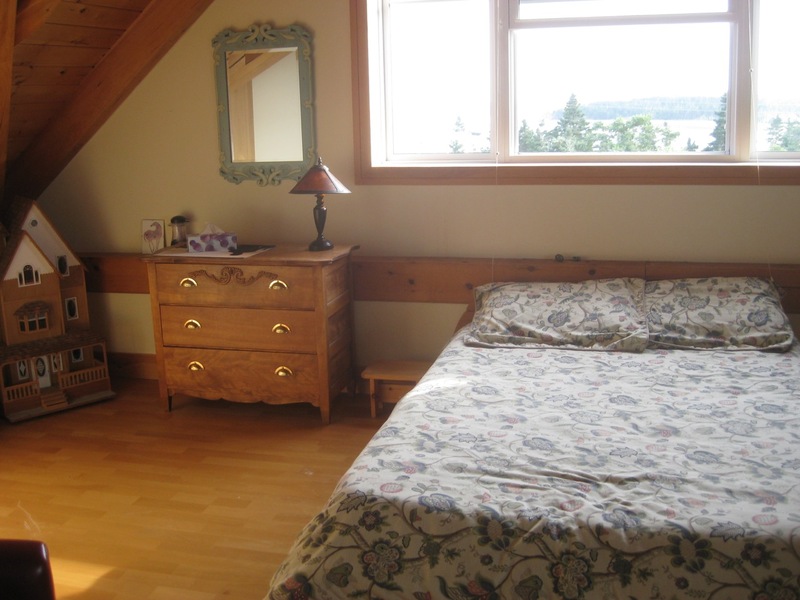 The new placement of the bed, the dresser from our den..a spacious guest room, with a great view. We treated ourselves to a movie “Beasts of the Southern Wild”, at the Oxford, our alternative theatre. 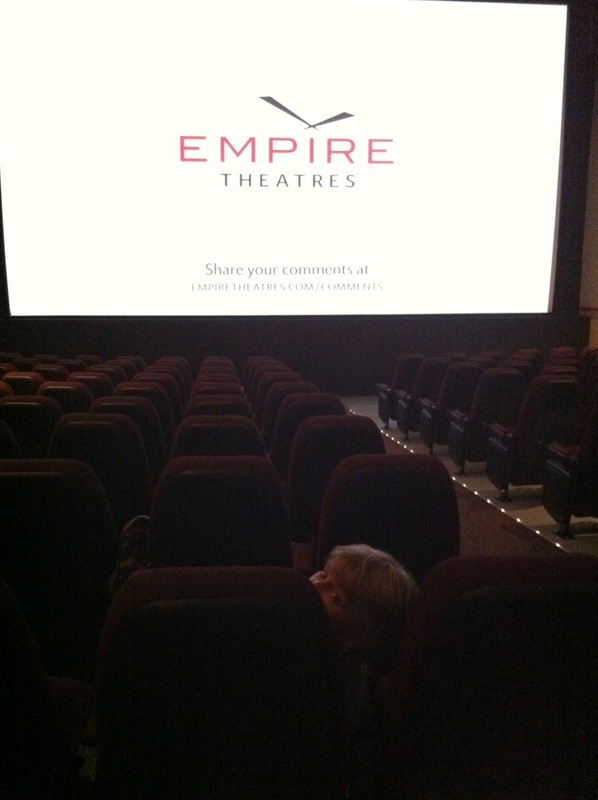 I guess we were the only alternative patrons tonight. Wonderful movie. Already today, though, I missed the family, missed them in their home, the energy of being part of creating the space for them to nest in. Birthing, nesting, moving, rearranging furniture, “these are a few of my favourite things.” (sing like Julie Andrews here). 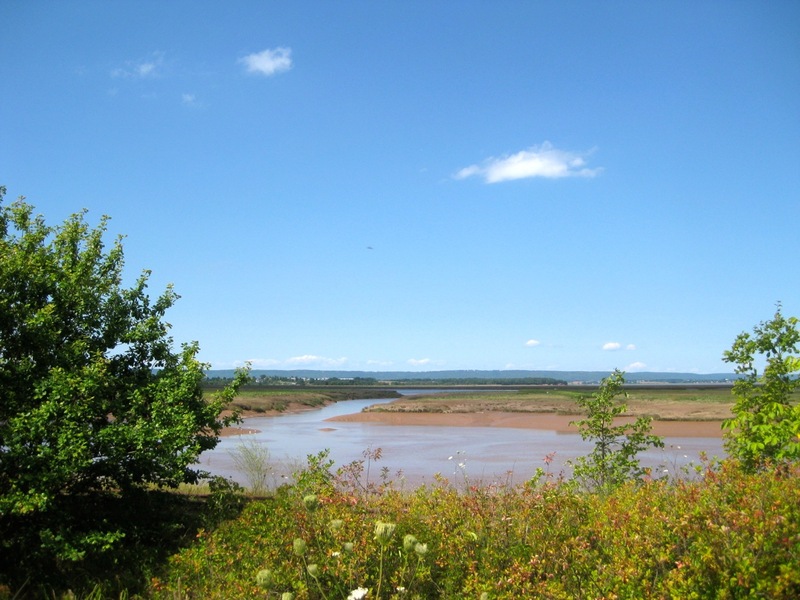 The Minas Basin was slowly filling as I walked Asa for 2 hrs. along the waterfront/railway path. The other night the water was at high tide, and the view was blue ocean. I’m constantly impressed at how it changes, and what the setting sun does to it as well, really well. To the left of the scene above, is the reason the area was dyked to begin with..to take land for crops. 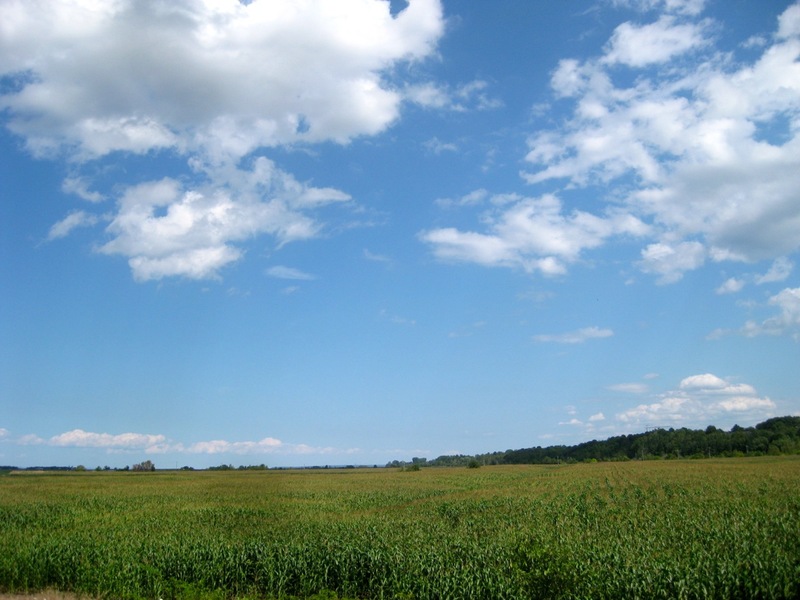 This is a field of corn growing at the edge of the Basin. Such different views wherever you go in this province, which is true of others too. You can go travelling in your own province and feel you’ve been on a trip. Our trip tonight was going home after dinner, to make appointments for Thurs.., then back to the happy valley on Friday. There is an urgent need to create a fenced yard, for Forest and his dog, and especially to build his sandbox, which he had to leave behind in N.Z.. I’m always surprised by how verbal Forest is about what he misses from N.Z.. It’s like thinking a child is less sentimental than an adult, or doesn’t feel the effects as deeply, because after all, he or she is still with their parents, and that’s the most important thing at that age. Actually, lots is important. 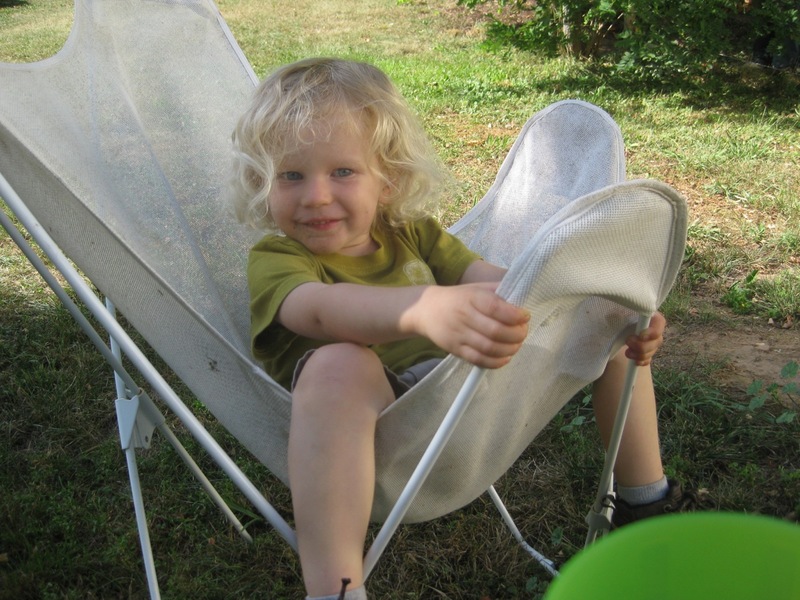 As an experienced grandmother, I am humbled to say I’m still learning things about children.